Looking for the best price on the Canon EOS 77D? Look no further – we've rounded up all of this month's best Canon EOS 77D deals below. It's easy to see the appeal of the Canon EOS 77D. By blending advanced features with a surprisingly portable body, the camera is ideal for those wanting something that's more than capable for a variety of tasks without it being a burden to carry around. At the heart of the camera, Canon has opted for the partnership of a 24.2MP APS-C sensor and the latest-generation DIGIC 7 processor. In addition to shooting stills over a wide range of sensitivities, this combination also allows you to capture Full HD videos up to 60p, which also benefit from 5-axis IS system to help keep everything nice and smooth and a mic input for the top-quality audio recording. To further help keep videos looking professional, Canon's clever Dual Pixel CMOS AF system is on board. With this, you simply tap the touchscreen with your finger and the camera will smoothly pull focus to that part of the scene. You can even flip this screen out and angle it to all sorts of positions – even all the way around to face the front! The Dual Pixel CMOS AF system is also great when using Live View as you can use the camera much like a compact or mirrorless camera, without the focusing delays and hesitations you used to get with DSLR Live View systems. Using the camera conventionally? There's plenty to keep you satisfied here too. The 45-point AF system covers a wide proportion of the frame to help your camera find the subject easily, and with each point being cross type it's extra sensitive to all kids of details. You also get the benefit of a top-plate LCD screen so that you can easily adjust and keep an eye on all key settings, as well as a very respectable 6fps burst-shooting option for those times when you need to capture any fast-moving subjects. 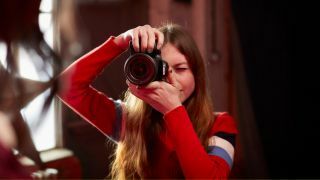 Add to that Wi-Fi and Bluetooth, a body that weighs just 540g and compatibility with a massive range of Canon lenses and accessories, and you can see that the EOS 77D is a cracking enthusiast's DSLR. Scroll on down to get the best price on the Canon EOS 77D today!